One of my goals for this year is to paint more flowers, so I wanted to break-in with a small piece. Not to worry though, at the request of a few there are a couple more snow paintings coming that will close out the winter of 2013-14. 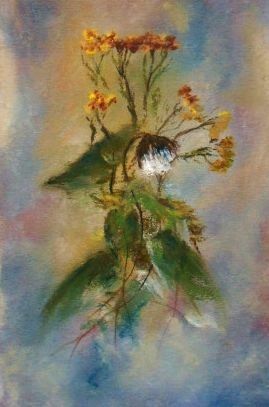 The latest oil pastel (6×4) is of a weed, really have no idea the name of the specimen, painted in a looser style. 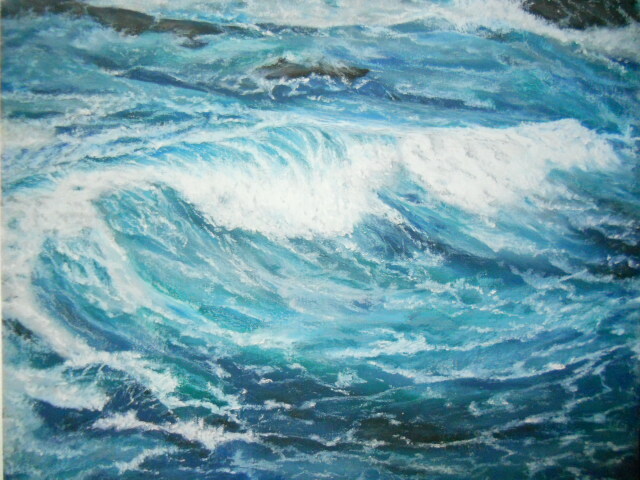 The surface for this painting was a Mi-Teintes pastel tinted gray paper using mainly Senneliers and NeoPastels oil pastels. This brand of paper handles Senneliers so well it’s very easy to manipulate and spread the paint around the surface, and blending develops some gorgeous color notes. The fine lines were achieved by using clay shapers pulling the oil pastels across the surface. Here is my first flower of the 2014 season – okay if I call it a flower even though it’s a weed, right? The reference image used was from Viacheslav a wonderful photographer from pmp. This entry was posted in About Oil Pastels, OPs New Paintings and tagged flower, Neopastel, Oil Pastel, pastel paper, Senneilier. Bookmark the permalink. Thanks Violet, glad you like it! Thank you very much and yes, I agree – there are some really beautiful weeds out there just waiting to be noticed. Mary that is a super weed painting looking forward to see your flower shop growing as I am sure we will al enjoy the smell every where around the globe. Great comment Doron, how funny and such a great description of a world-wide community event! Gorgeously painterly! The color, delicacy, values, are really wonderful! Thank you Elena. I’d like to expand a little more in this area – so appreciate your comments! Thanks Annie, I’ve got to go through the process of selecting them now – I’ve some ideas but will have to wait for a while before I can get to it. Simply gorgeous, Mary! I love it! Thank you Francesca for your beautiful comment! Wow Stephen, thank you for your lovely comment, you know how to make ones day! Very soft … I can see a weed, but I also see a flower. Hello #1 fan, thank you for your beautiful comment! Mary – it’s simply wondrous to watch the exponential growth in your work. Quite a gift to the world emerging. Your winter images are really splendid. We still have several months; don’t quit with them too soon! Hi Craig, thank you for your very generous comment – you always know just the right words to spur one on. More snow paintings? There may be several more coming over the next week or so. Have a beautiful day! You like flowers and I like weeds. But I, like Fred Astaire, love your first flower. As for Ginger Rogers, that’s another matter. Thank you Ariel’s Prospero – very nice. I know you can appreciate this little weed-flower! It’ll be interesting to see what flowers you’ll be painting … any from your garden you have in mind ?? Hi Poppy, thanks very much! Actually I have several good pictures from the first year of my garden that would make for several wonderful paintings. After the first year, a lovely little rabbit seems to come by just when the perennials are at their tasty best – really not too funny though. So I’m not holding my breath for a flush garden this year, but you never know! This reminds me of a botanical print. Very nice! Thanks Elisa – I enjoyed pushing the background on this painting. I thought the same as you when it was done. I’d like to do a couple of 16×12 pieces similar to this one. This is absolutely beautiful Mary!